When the power and energy of the high tide is spent, the waters of the Bay begin to recede and slowly ebb. And by low tide, more than 1,000 square kilometres (620 square miles) of ocean floor lies unprotected and exposed to the atmosphere (Burzynski and Marceau, 1984). Fundy’s retreating tides bestow every beach with a substantial intertidal zone and relinquish millions of organisms in the wet, soaked and soggy sands, rocks, and mud. While these forms of animal and plant life exist half the day submerged and half the day uncovered, they require the unique ability to adapt to both extremes, including significant variations in temperature and salinity(Randall et. al, 1998). Saunter along the low-tide mark and search for small, hardshelled creatures such as mudshrimp, clams, crabs, periwinkles and barnacles. You will also encounter large concentrations of plant life such as rockweed, seaweed, kelp, Irish moss and the local delicacy – dulse, ruddy ribbons of an edible seaweed sometimes call the “salad of the sea”. Dulse must be dried before it is eaten, but be forewarned, as with many exotic natural foods, it is an acquired taste. Low tide also provides the opportunity to explore the ocean floor for the flotsam and jetsam bequeathed by the tides, including driftwood and other castoffs of man and nature. 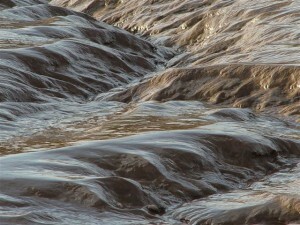 At the head of the Bay of Fundy lies the most significant intertidal zone – the great mudflats of the Minas Basin – a vast and expanse of slime and sludge. But this morass has been one of Fundy’s most cleverly disguised secrets. Only in recent decades have scientists concluded that the mudflats are a boundless biological pump and are a vital feeding area for more than one million shorebirds of various species (Thurston, 1994). The currents in the Bay of Fundy cause upwelling of nutrients from the ocean floor, resulting in a biologically active photic zone (the area near the top of the water where light can penetrate) with an abundance of both phytoplankton and zooplankton – the most critical links in the marine food chain (Smith and Smith, 1998). This explains the presence of seabirds like puffins, auks and tems on the breeding islands in the western end of the Bay. But this mudflat intertidal zone supports millions of delicate, soft-bodied organisms that could not survive along the hard, rock-encrusted shores. 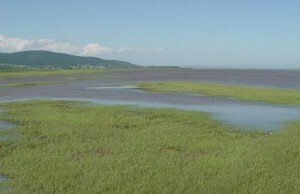 And so this unique location is the primary reason that the Bay of Fundy is the single most important stopover point for migrating shorebirds along the entire eastern seaboard. An estimated two million birds of all species visit here annually. When the tides begin to rise on the mudflats, clams hiding just a few centimeters below the surface start pumping water through their siphons, filtering food from the muddy water. Small snails and shrimp emerge from the muck to feed on the film of algae. And as the tide waters continue to rise, bottom-feeders like flounder, shad and tomcod move in to feast and thus trigger yet another cycle in the biological chain. From the huge herons and cranes to the tiniest of songbirds, the Bay is considered an omithologist’s paradise, particularly during the spring and fall migrations. Once a year the mudflats become the world stage for a spectacular display by millions of semipalmated sandpipers. On or about July 18th, great black clouds of sandpipers circle the mudflats and then swoop in to land, concluding their 1500 km (930 mile) non-stop journey from their arctic breeding grounds. They spend 10-14 days on Fundy’s mudflats, getting fat by gorging on the glut of mudshrimp. Most of the birds double their weight in preparation for the 4000 km (2500 mile) non-stop migration to their winter grounds in South America. They will complete that over-water odyssey within 72-80 hours. The saga of the sandpipers is but one example of the extraordinary attraction the Bay of Fundy provides to hundreds of species of birds – both shorebirds and seabirds. Even one of the world’s most en angere species, the great American bald eagle, thrives along Fundy’s western shores (Thurston, 1994). Above the daily, tireless onslaught of the tides stand the tall and distinctive forests surrounding the great Bay. 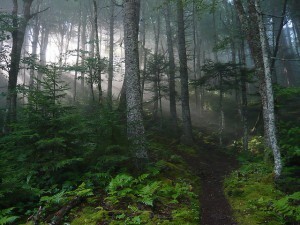 And while free from contact with the heavily salted waters, the forests of Fundy are yet still influenced and swayed by the environmental forces at work. The evergreens (spruce, pine, fir) are the most prevalent, withstanding the ocean winds, heavily-salted air and frequent fog. They are rugged, weather-worn stands, having even learned to take root on the rocks and craggy shores. The deciduous growths and hardwoods are further from the Bay, unable to tolerate the harsh, damper coastal conditions. As further evidence of the dynamic ecosystem unfolding is an entirely microscopic forest not appreciated by the casual glance. Near the forest floor an array of mosses and lichens in rainbow colours thrive in these misty surroundings and create a miniature community of life for insects, algae and fungi – and a repast for smaller animals. The plants are consumed by the herbivores, which are in turn eaten by carnivores – and the life cycle continues. The coastal forests represent a vital transitory link between the complex marine world and the rising grounds and dense growth of trees further inland (Smith and Smith, 1998). Among the most diverse and fascinating ecological systems found on this planet are the bogs which proliferate in dark corners contiguous to larger bodies of water. The many bogs circling the Bay represent yet another spoke in Fundy’s great ecosystem wheel. Bogs form where water drainage has been blocked from a previously existing pond, lake or salt marsh. Comprised of up to 90% water, they are host to a wide variety of both biotic (living) and abiotic (non-living) substances. Over time, various sediments migrate from the surrounding banks, and they begin to fill the newly forming bog from the bottom up. As sediment levels rise, so too does the abundance of abiotic substances and therefore, only certain biotic species can survive – such as cranberry, reindeer moss and peat moss. Since nutrients are scarce in this wet, swampy milieu, carnivorous plants abound. To obtain vital nitrogen, much of the flora, including pitcher plants, sundews and venus fly traps, has turned to eating insects and ants in order to survive and reproduce (Smith and Smith, 1998). 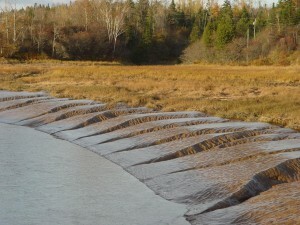 Another essential component to the prodigious ecosystem of the Bay are the salt marshes – expansive wetlands which twice daily flood with the rich and nutritive Fundy waters. Owing to the natural fertility of these lands, they have been prized by agriculturalists, but others have valued the inherent productivity of saltmarsh wetlands as a wildlife resource. The marshes have been built, (indeed, are constantly being replenished) with inorganic mud, flourishing in minerals, delivered by the tides. The prime vegetation of these wetlands is a tough, tall grass known as Spartina or salt cordgrass. This rugged growth has adapted to the rigorous saline environment by excreting excess salt through specialised cells, just as seabirds do. Most other forms of foliage would certainly not survive in such a strong saline environment. The salt marshes draw insects, millions of them, which feed on the abundant growth found throughout these damp, dank and humid swamps (Smith and Smith). More than 400 species of insects have been identified in the Fundy salt marshes. And the insects, of course, provide an irresistible lure for the birds. Some 228 bird species have been recognised as regular visitors. Topping the waterfowl lists are Canada geese, black and mallard ducks – all shameless opportunists who take full advantage of the profuse and brimming nourishments in the low, sinking wetlands (Thurston, 1994). Pinet, P.R. 1998. Invitiation to Oceanogoraphy, web enhanced ed. Jones and Bartlett Publishers. Boston, Ma. Burzynski, M. and Marceau, A. 1984. Fundy: Bay of the Giant Tides, 3rd ed. The Fundy Guild Publishing, Alma, New Brunswick. Randall, D., Burggren, W. and French, K, 1998. Animal Physiology: Mechanisms and Adaptations, 3rd ed. W.H. Freeman and Co. New York. Smith, R.L. and Smith, T.M. 1998. Elements of Ecology, 4th ed. Benjamin – Cummings Publishing Co. Menlo Park, Ca. Thurston, H. and Horner, S. 1998. Tidal Life. Nimbus. Toronto. I went to the Maritimes for the first time in July of 2011 and was disheartened by how few seabirds and intertidal life I saw. Nearly no sandpipers and gulls, practically no clams beneath the sand or mud, no crabs at low tide. Where was everybody? Had they all left for points south or buried themselves in deep by July? Actually, they probably hadn’t arrived yet. The first semipalmated sandpipers generally do not arrive in the Bay of Fundy until mid-July. You’ll typically see very large flocks in August.